When your dog gazes up at you adoringly, what does it see? A best friend? A pack leader? A can opener? Many dog lovers make all kinds of inferences about how their pets feel about them, but no one has captured images of actual canine thought processes – until now. 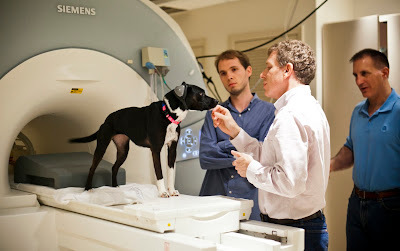 Emory University researchers have developed a new methodology to scan the brains of alert dogs and explore the minds of the oldest domesticated species. The technique uses harmless functional Magnetic Resonance Imaging (fMRI), the same tool that is unlocking secrets of the human brain. The Public Library of Science (PLoS ONE) published the results of their first experiment, showing how the brains of dogs reacted to hand signals given by their owners. Callie wears ear protection as she prepares to enter the scanner. The research team includes, from left, Andrew Brooks, Gregory Berns and Mark Spivak. Photo by Bryan Meltz. Key members of the research team include Andrew Brooks, a graduate student at the Center for Neuropolicy, and Mark Spivak, a professional dog trainer and owner of Comprehensive Pet Therapy in Atlanta. Two dogs are involved in the first phase of the project. Callie is a two-year-old Feist, or southern squirrel-hunting dog. Berns adopted her at nine months from a shelter. McKenzie is a three-year-old Border Collie, who was already well-trained in agility competition by her owner, Melissa Cate. Both dogs were trained over several months to walk into an fMRI scanner and hold completely still while researchers measured their neural activity. 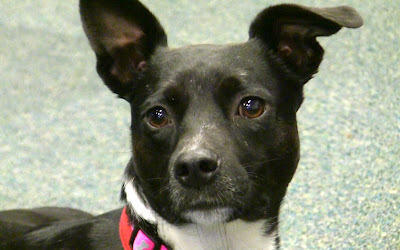 Callie, a two-year old Feist, is one of two dogs involved in the initial phase of the project. Photo by Carol Clark. Berns is a neuroeconomist, who normally uses fMRI technology to study how the human mind works. His human brain-imaging studies have looked at everything from why teens engage in risky behavior to how adults decide to follow, or break, established rules of society. Callie training in a scanner mock-up. The dogs were trained to wear earmuffs, to protect them from the noise of the scanner. They were also taught to hold their heads perfectly still on a chin rest during the scanning process, to prevent blurring of the images. “We know the dogs are happy by their body language,” says Mark Spivak, the professional trainer involved in the project. Callie, in particular, seems to revel in the attention of breaking new ground in science. It's amazing what dogs can be trained to do. I can't wait to see the results of more specific tests of what and how dogs are thinking. Congratulations for your research, it looks really interesting. I have a question, why can you use fMRI? Could the PET method obtain the same information? PET, or positron emission tomography, is an invasive, nuclear medicine technique. It is inappropriate for this research, which uses harmless fMRI. perhaps Javi was asking the question re: PET, with tongue in cheek? 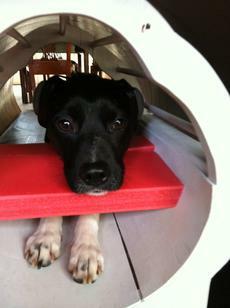 @Anonymous, your insightful comment brings up another point: CAT scans would also be inappropriate for the dog project. This is very interesting research! I look forward to reading more about this. Hopefully your team will help us better understand the brain mechanics behind domestication as well. Researchers certainly live sheltered and boring lives. A child with a dog will tell you dogs can learn anything. Dear Penny: By your "logic", we shouldn't do any research, we should just ask a child. You need a better hobby, because a penny for your thoughts is a lousy investment. But dont take my word for it, just ask a child. So, I can tell you what this human is thinking. I already knew that dogs are very teachable. Other than that, I can't say you taught me anything new. By the way, dogs are very, very attuned to human "signals". We watch TV and they watch us (and listen). They watch each other. They communicate with each other on a different level. They signal each other through eye, ear, nose, head, tail, body, and sound and even touch. I am writing from Kolkata, India. I read a small piece of news on Emory's research and made it a point to visit your website and read up more. Would look forward to the results, hoping that it would create more empathy in humans towards our four legged friends. We have two pets at home - Meethi & Cheeni. And the way they connect with us, and read our minds, is amazing. I am so very thankful to have them around. So what are they thinking when they stare at you? It may depend on the situation, like whether you're holding a hot dog or a rolled-up newspaper. We'll have to get back to you on that. Yes, I feel like the real question here is (for me) very selfish and it is "does my dog love me?" When you say "What is your dog thinking? ", I don't understand your definition of thinking re humans and dogs. That is to say, is the dog thinking, as humans do, that he is going to receive or not receive the treat, or, is he responding to training retention, and do you consider that canine thinking? This is fascinating research. I'm eager for the printed findings ... and further research. Suggestions: What are dogs brain results when viewing stimulation such as other dog's fighting, or canine mom with puppies nursing, or human master calling her on TV screen? I can tell you, yes dogs love, yes they pout when a suitcase is opened, yes they are mad for days when owners return, yes they try to live for us when they are dying, yes they feel and love and read our hearts. It take little trigger, a yellow bag, a word "boat", to have them talk and rejoice at a boat ride. Sometimes they are smarter and more responsive than people. Thank you for your research to prove in science to the "others" what most dog lovers know. Awesome research! I look forward to future studies! It would be interesting to see the difference between the reactions depending on how the dogs were trained.